There are many great reasons to love working out, from the increased confidence it affords you, to the way it can help in your relationships, to the way it increases your ability to compete in sports and other physical activities. However the main thing I love about the gym is that it's action packed. You see I spend most of my time working on the computer, and when I'm not doing that I tend to come home and read or play computer games. It's a sorry state of affairs really because what I actually want to be doing is having adventures and engaging in battles. 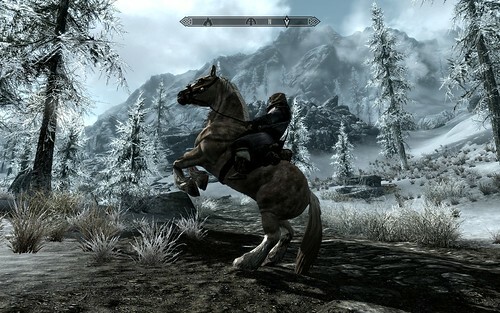 I don't really want to play games like Skyrim, I want to live them - but sadly the reality of walking through woods all day carrying a large weapon and attacking animals is a lot less practical and realistic than that game would have you believe. But when I'm in the gym I'm no longer just pushing pencils - I'm testing myself. I'm heaving, I'm fighting and I'm feeling the camaraderie and the satisfaction of accomplishment. In other words, while I'm in the gym I have more in common with a warrior from Skyrim than I do with someone working in an office and it feels awesome. And holding on to this is often what helps me to get myself to the gym when I really just feel like staying home and watching a distracting film. Here's how I make sure I always remember that working out should be an adventure, and how I make it that bit more exciting. One thing that can always help you both psychologically and physically to excel in the gym is to set yourself challenges and then go for them. This could be something like lifting a certain amount on the bench press, or it could be doing some huge giant set you've conjured up while on the commute home from work. If it gives you a sense of fear, then that's all the better. Another way to challenge yourself is to try something you've never tried before - which in the gym might mean handstand push ups, weighted dips, or using some kind of machine you've never really understood. Adventure is about discovery and new experiences, and that can apply to the gym too. All of this becomes a lot more exciting when you have a gym buddy to share in your adventures. You will form a brotherhood under the iron in a way that I imagine soldiers do in the barracks together. You will see each other at your lowest ebb, and you'll have only your partner's voice to keep you going. Then when you finish you can go and recount your tales over a pint of ale. One thing that makes any action scene even more dramatic and exciting in films and games is to have an amazing piece of rock music or orchestral score in the background. This is something you can mimic yourself in the gym by simply listening to some heavy metal or some OSTs while you're lifting. When you're at your lowest point and you hear the Superman theme tune pipe up it can be just what you needed to spur you on. If you are struggling to find the gym all that exciting, then there is another alternative which is to train outside in the wilderness. Set yourself up a circuit and run from station to station where you can then do pull ups from trees or dips from railings. It's hard not to feel awesome when you're holding a tree trunk over your head - and if you're outdoors then you can make noise too. Paul White is a fitness trainer. When he is not busy flexing his muscles, he likes going on calming trips with his friends. You can visit his website to know more about the bariatric products and their benefits. Submitted by Garry Davidson (not verified) on Wed, 03/13/2013 - 09:31. I really think the secret to getting into shape is finding a way to ENJOY exercise. Making it an adventure is an excellent way to do this. Personally, I hate exercise. I hate the huffing and puffing, the pain and burning in my muscles, can't stand it. Heck even Muhammad Ali said he hated every second of his training. Unlike Ali though, I don't have unyielding willpower, and the only way for someone like me to get into shape is to somehow make exercise FUN. My biggest transformation came when I started to challenge myself in being able to handle my body weight. I asked myself, "What if I was a hunter gatherer? Or the dude from Skyrim? I wouldn't survive very long if I couldn't sprint fast or pull myself up onto a tree-branch." So I started doing pullups, handstand pushups, pistol-squats, sprints, and took up a martial art. It was all with the intention of becoming a better human being, one that could survive out in the wilderness. Once I took my focus OFF just trying to lose weight and LOOK good, and switched my focus to trying to be super-Grok, exercise really didn't feel so bad anymore.